26 / the tasting panel / december 2017 The Ransom Note is a monthly column by The Tasting Panel's East Coast Editor, David Ransom. Each month, David connects readers with some of the people, products, and events that are making news along the Eastern Seaboard. T his fall I had the chance to try lots of wonderful wines from many of my favorite places. There's too many to list, really, especially during portfolio season; when everyone is touting new vintages and products for the holidays, there's simply not enough page space to report on everything I liked. So, here are a couple of tastings—one big, one small—where the wines that resonated with me proved they're worth seeking out this holiday season. 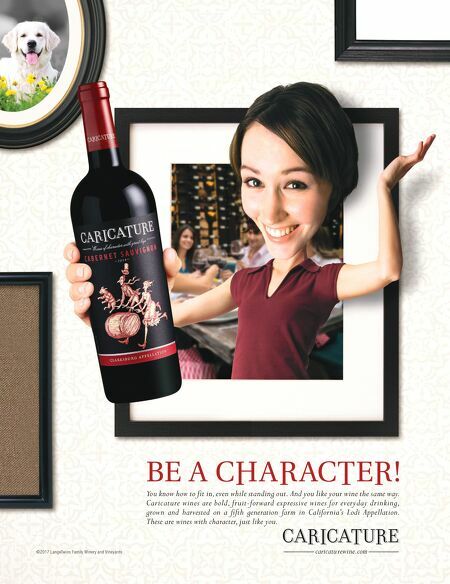 First, at a lunch in Manhattan's Il Gattopardo, I had the pleasure of tasting through the wines of Campania's Donnachiara winery with its owner, Ilaria Petitto (Petitto's mother, Chiara, founded the Montefalcione-based winery with the mission to preserve the legacy of traditional local grapes varieties). Petitto works with famed enolo- gist Riccardo Cotarella to produce some of the region's most intriguing wines with Campania's signature grapes: Falanghina, Fiano, Greco di Tufo, and Aglianico. All small- production lots, a couple of favorites were an outstanding Falanghina called Resilienza and a pair of Taurasi DOCG (Irpinia) Aglianico wines: the 2013 and 2012 Riserva (Michelangelo Imports). Next, I hung out with the hipsters at the RAW WINE 2017 wine fair in Brooklyn's gritty Bushwick neighborhood. A celebration of all wines natural, organic, biodynamic, orange, cloudy, and fizzy, RAW WINE was founded by Master of Wine Isabelle Legeron to "showcase growers from around the wine world whose fundamental farming and cellar practices make these living wines possible." About 150 producers from more than a dozen coun- tries participated, pouring their wines for the mostly plaid–wearing, tonsorially-trendy attendees who flocked to try wines from producers like Italy's Gravner, Chablis' Château de Béru, and California's The Scholium Project. Also pouring was Priorat's power couple, Sara Pérez of Mas Martinet and René Barbier, Jr., of Clos Mogador, who craft some of that region's most phenomenal organically- farmed wines. Their co-produced Venus La Universal—an elegant Garnacha/Cariñena blend from a ten-acre vine- yard in D.O. Montsant first made in 1999—steals my heart every time I try it, and pours of both the 2006 and 2013 did not disappoint. (All various importers and distributors.) 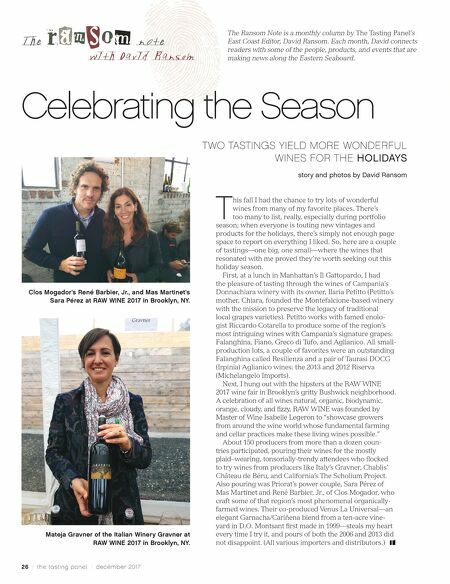 Celebrating the Season TWO TASTINGS YIELD MORE WONDERFUL WINES FOR THE HOLIDAYS story and photos by David Ransom Clos Mogador's René Barbier, Jr., and Mas Martinet's Sara Pérez at RAW WINE 2017 in Brooklyn, NY. Mateja Gravner of the Italian Winery Gravner at RAW WINE 2017 in Brooklyn, NY.